Traditional goodies always add a touch of sweetness to the holidays. Updates to some of your favorite holiday classics help keep family traditions alive while incorporating creative and on-trend ingredients. Everyone knows fruitcakes have long been a holiday tradition, and new and improved versions of this timeless treat are making a festive comeback, causing many holiday guests to go back for seconds. 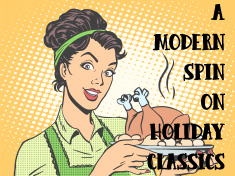 To add a spark of creativity to your kitchen, Betty Crocker is pleased to release their Red Hot Holiday Trends. With exciting flavor innovations that range from sweet and savory cookies to caramel popcorn adorned with dulce de leche, this list includes global culinary trends that will liven up any holiday spread. Why not try this refreshed take on fruitcake to make people wonder why they ever discounted this holiday dessert? A modern take on a Christmastime classic, this luscious two-layer upside-down apple cake, studded with whiskey-soaked fruits and filled with sweetened mascarpone, will be the belle of any holiday ball. To check out all of the Red Hot Holiday Trends, for information on Betty's Holiday Helpline and for more great recipes, visit www.BettyCrocker.com/redhot. In medium bowl, mix dried cranberries, apricots, orange peel and bourbon. Let stand at room temperature 1 hour or overnight. Heat oven to 350°F (325°F for dark or nonstick pan). Generously grease bottom and sides of two 8-inch round cake pans with shortening. Line bottom of each pan with cooking parchment paper. Grease parchment paper with shortening. Line bottom and side of each pan with overlapping apple slices, cutting slices as necessary to line side of each pan. In large bowl, beat cake mix, water, ground almonds, oil and eggs with electric mixer on low speed until moistened, then on medium speed 2 minutes, scraping bowl occasionally. Stir in soaked dried fruit and ginger. Gently pour into pans over apple slices. Bake 40 to 45 minutes or until toothpick inserted in center comes out clean. Immediately turn pans upside down to release cakes onto cooling racks. In small microwavable bowl, microwave apple jelly uncovered on High 15 to 30 seconds, stirring every 15 seconds, until hot. Brush over apples on top and side of each cake to make shiny. Cool completely, about 1 hour. Meanwhile, in medium bowl, beat mascarpone cheese, whipping cream and sugar with electric mixer on high speed until stiff peaks form. On serving plate, place one cake, apple side up. Top with whipped cream mixture. Gently place remaining cake layer on top of cream, apple side up. Garnish with fresh cranberries and orange slices. Cut into slices with serrated knife. Cover and refrigerate any remaining cake. Grind the slivered almonds in small food processor, or very finely chop with knife. Garnish with toasted, sliced almonds, if desired. Make it ahead and save some time! Prepare the dried fruit the night before, or bake the cake layers, and whip up (and refrigerate) the topping a day early. Put the cake together the day you serve it for best results. Upside-Down Apple Cake with Whiskey-Soaked Fruit This layered cake can also be made as two single layer cakes for smaller gatherings. 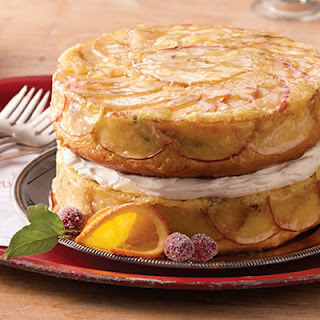 Skip the stacking of the layers and place a single cake layer, apple side up, on a cake stand. Top the cake with a dollop of the sweet cream topping, and garnish with cranberries and orange slices.